Yesterday I replaced all the vacuum actuators (pods) for the climate control system in my sister's 1987 300D. Of the 6 total, only two are accessible without removing the dash - the pod for the floor vent flaps (pull the pushbutton unit to access this one), and the one for the defroster flaps (behind the glove box.) The other four - 1 center vent, 1 diverter, and 2 recirc - require pulling the dash. That means yanking the instrument cluster, steering wheel, p/b unit, glovebox, both lower trim panels, and then the whole dashboard. And then you need to pull off the top of the heater box to do the center vent & diverter pod, which is also a pain. This car (with 155kmi) had 4 bad pods: center vent, diverter, recirc (small lift), and defrost (small lift). Needless to say the system was NOT functioning as intended, although the ONLY symptom was a lack of air from the center vents with the A/C on. W124's are sneaky that way. So, I've said it before and I'll say it again: If you own a W124, particularly one that's older or with high miles, you should check the operation of the pods to make sure your ACC is working as designed! It's easy to test. 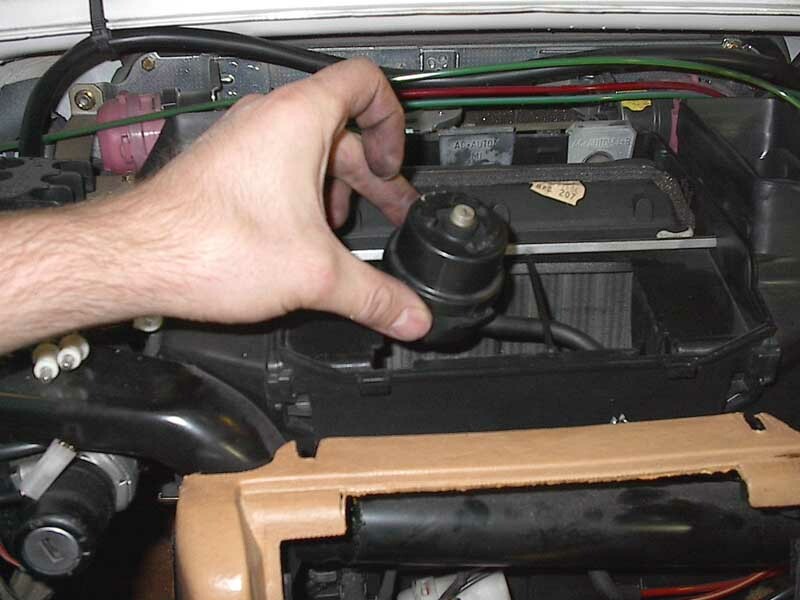 Pull the glovebox and the 7-port manifold is right there on the left side, attached to the heater box. Remove one hose at a time and connect a MityVac. Each hose should hold vacuum. If not, the rubber diaphragm for that pod is torn. You can identify the function from the ACC service manual, if you want to know what's not working (assuming it's not obvious). The pods from Rusty (or FastLane, etc) are ~$15-20 each for the single chamber ones (center vent, floor, and diverter), and $25-30 each for the dual chamber (both recirc and defrost). I've heard that George Murphy sells a diaphragm kit to repair the pods but I don't know details or pricing, or how hard it is to repair them. It took me 2 hours to remove the dash, 1.5 hours to replace the 5 upper pods (I left the footwell pod alone), and 2 hours to reinstall the dash. Total was 5.5 hours. If you do this, I HIGHLY recommend replacing ALL the pods that require dash removal!!! This is NOT a job you want to repeat a few months down the road when the next old one fails. Change 'em all and then you don't need to worry about it for the next 10 years or 200kmi. The two exceptions are the ones that don't require dash removal; the defrost & footwell pods. These can be done at any time in 30-60 minutes. NOTE: Of the pods above, only the -02-75 (center vent) can be properly "rebuilt" using the diaphragm kits from Performance Analysis. The dual-chamber pods can only have the 'small lift' portion rebuilt properly. The diaphragm kits for the dual-chamber 'large lift' will restrict movement and should NOT be used... replace the recirc+defrost pods with new pods only! 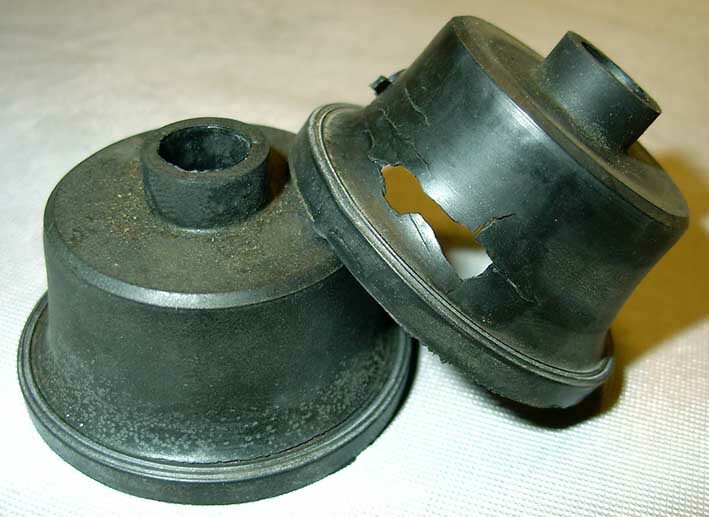 There are no rebuild diaphragms available of any kind (good OR bad) for the small round pods (diverter and early footwell), nor for the rectangle pods (late footwell). Do yourself a favor - grab your MityVac, pull the glovebox, and check them out! Summer's coming up fast and a fully working ACC is a beautiful thing. Last edited by gsxr; 01-05-2009 at 07:44 PM. I recently acquired a 1989 300E with 127,000 miles. The blower fan never seemed to go on high, but knocked softly instead. The knocking has stopped, but no high fan. I've been investigating that problem and today pulled the glovebox to see what I could see. I noticed that the pod behind the glovebox (you said it is for the defrost) does not activate unless I push the metal connector in a bit. Once in (when on a/c or economy) it will go back up as long as I do not let it go out completely (i.e. by putting the system on defrost, bi-level or off). Once all the way out, it will not go back in. Think this is a vacuum problem? That sounds odd. I'd test the actuator first, using the procedure described above (apply vacuum to both ports on the pod). Use a Mity-Vac if you have one, if not, use the source line into the top of the 7-way manifold with the engine running. Note: With vacuum applied to one of the two ports, it will move a LOT. When applied to the other port, the movement is almost invisible. You can see it if you watch closely though. With a MityVac (the kind with a gauge on it), you want to make sure both hold ~25 inches vacuum. If the diaphragm is torn it won't hold any - dead zero, usually. If your pod checks out, it's either something with the vacuum plumbing (not likely), or an electrical gremlin (more likely). Does anyone know what the diverter flap is used for? I pulled my glovebox today, and tested all the vacuum pods - this one and the recirc small lift are bad. Symptoms are no air through center vents (center vent pod holds vacuum, but I can't hear any flap actuation), and low air volume - high blower sounds like high blower, but only puts out min blower air. When I applied vacuum to the diverter pod, it wouldn't hold a vacuum unless I quickly applied more than 10" Hg, then it held, but slowly leaked. With the engine/fan on, I got lots of air through the center vents, but little through the side vents. p.s. Thanks for an excellent post, I've referred to it often enough that it gets bookmarked..! Wow, that does sound odd. The diverter flap, from what I understand, allows a different airflow path through the internal coils. I'm not sure what the exact function is. I do know that if your center vent pod is dead, you can switch the signal to the diverter pod (if it's good) and get air out the center vents, otherwise your AC operation is poor with no center vent airflow. The side vents are fully open at all times with no flaps controlling them. If airflow is poor there, you either have a blockage, or the end vane piece (what you angle & adjust with your fingers) is not installed into the duct properly. About the center vent, it will only blow cold air... with the heater on nothing comes out there. 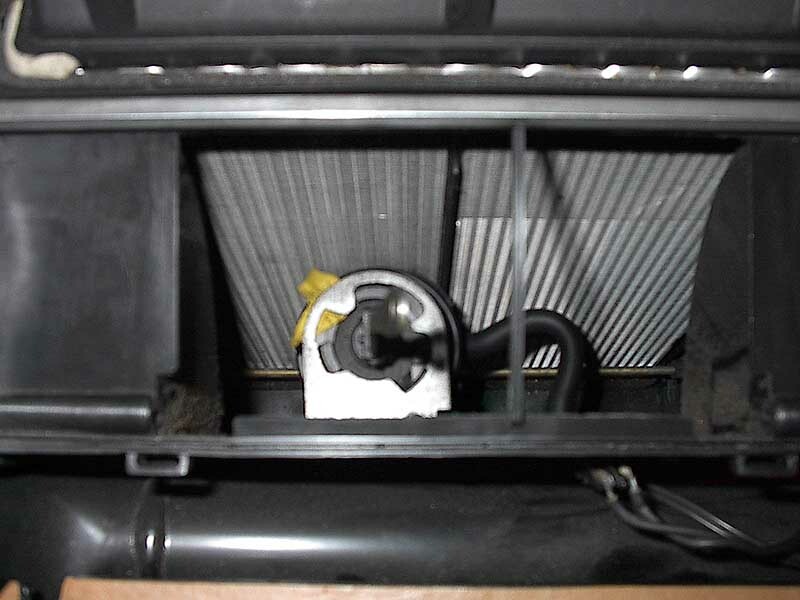 When you apply vacuum, you should be able to look through the center vent opening with a flashlight and see the "floor" drop away, revealing the AC evaporator (just barely visible). If you see no movement, your center vent pod is either dead or disconnected internally, or perhaps has a pinched/blocked hose? Last edited by gsxr; 04-26-2003 at 06:17 PM. I still haven't figured out what the diverter flap is for, from the shop manual it looks like it only opens when the system is on 100% recirc, and lets a greater volume of air through the center vents, but it's closed on any other setting. Since I don't get any air through the center vents period, I think the diverter pod is dead, and the center pod must be disconnected (or otherwise broke) somehow. I tried looking through the center vvents to see if I could detect any actuation of the center pod, but there's another flap in the way (the one connected to the thumbwheel on the vent itself). Thanks for your help so far - if you do get pictures (!!!) on the dash removal, I bet a lot of people would love to see them. I know I will. Last edited by gsxr; 08-18-2005 at 11:43 AM. I'll upload a couple that are small enough to get through the forum size limit, for those of you too lazy to click the link. Here's a photo of the innards. One obviously has lots of holes and is all torn up. The other one had hairline cracks near the wide bottom end, almost invisible until you start pulling on the rubber and find out it's not all one piece any more! Just a quick update to my original post (which I have edited). The vacuum pod rebuild kits sold by Performance Analysis company work on single-chamber, large size pods only. That means for the 124 it will rebuild the center vent pod and that's it. On a 123, same deal, center vent pod only (possibly the footwell flap, I'm not sure). The 124 diverter pod is smaller, and the older 124's have a rectangular footwell pod. For the dual-chamber pods, the rebuild kit will fix the forward (small lift) section only. The rear (large lift) section is non-rebuildable! The kit has an interesting way to get around that, and it looks great, but DOES NOT WORK. It looks like it works, but when you apply vacuum and measure the rod travel on a new one (or good used one), compare that to the freshly rebuilt pod. The rebuild simply does not have as much travel. It all makes sense when you see it, but it's very hard to describe. That means if you use the rebuild kit, your pod won't fully open the flap it's connected to! And considering the amount of work needed to pull the dash & replace these things, you don't want to screw around. Buy NEW pods - for EVERYTHING - and replace them all at once. Believe me, it's worth it, and having the system work as intended is a beautiful thing! I looked at your 350SD head replacement pics. Very impressive. Just for future reference, what is the part number for the new head? If I decide tog et one of those beastly engines, how will I be able to tell if the work has been done? Nice pix !! Any ideas how I might clean mold/mildew out of my '82 300SD 126 core without taking the dash off to get to it? Everything I read says the core is buried too deep for casual access. I've taken off my blower motor and cleaned it out, but as the humidity of summer approaches, I can smell the mildew when the ACC is on. Any thoughts would be appreciated!